The KMHS Foundation invites our community to California Dreaming as we honor Dr. Kevin Daniel with a Farewell Dinner. This is our opportunity to show him how thankful we are for all he has done for our children and Kennesaw Mountain High School. He will be taking the position of Area 2 Superintendent. The dinner is at California Dreaming on Tuesday, November 18, 2014 from 5:00 pm until 8:00 pm. Reservations are recommended. Call 770-428-2055. California Dreaming will be donating 15% of the proceeds back to KMHS Foundation to support Kennesaw Mountain High School. What a fun way to get in the Christmas Spirit — California Dreaming, 745 Chastain Rd in Kennesaw has invited Santa to visit on Tuesday, December 17 from 6-9 and you and your family are invited to come have dinner with Santa. Plan on visiting Santa at California Dreaming, where he will take the time to listen to all the kids wishes and pose for photos. Stay for dinner and make this an extra special night for the family. California Dreaming is located on Chastain Rd at I-75. Greg Carter, owner operator, is an involved member of the community and advises that one way California Dreaming is giving back this Christmas is by collecting toys for the Jerry Worthan Memorial Christmas Fund sponsored by the Kennesaw Police Department. Greg states they have collection boxes in the front of the restaurant and will be collecting toys from now through December 17. — Last year California Dreaming collected over seven huge boxes of toys, many coming from the East Cobb Lions Club and students from Kennesaw Mountain High School, both of which make a significant contribution to our toy drive every year as does Piedmont Church. When you donate a toy you will receive a card good for a free appetizer or dessert.. The evening with Santa includes: Free Pictures with Santa! Face Painting! 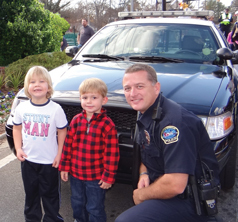 Meet Kennesaw’s Police Chief Bill Westenberger! Live Holiday Music! Free Treats for the Kids!Make your own S’mores! Grab your family, friends, neighbors, pick up a toy for someone between the ages of newborn and 15 years, and jet over to California Dreaming 745 Chastain Rd near I-75. 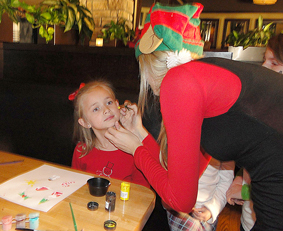 Free photos with Santa, free face painting, live music. California Dreaming is partnered with the Kennesaw Police and the Jerry Worthan Memorial Christmas Fund – so if you bring a gift you receive a card for a free appetizer or dessert. Starts at 6:00 pm – ends at 9:00 pm. Call (770) 428-2055 for reservations. Pictured at left: Sgt Luther explains the value of giving to Carson and Jack.